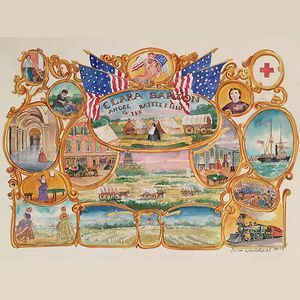 We are excited to announce our intention to install of a 14-foot-wide by 10-foot-high mural in the Clara Barton Missing Soldiers Office Museum (CBMSO) in Washington, DC. This public art project, depicting Clara Barton’s accomplishments while she lived and worked in the space, will be accessible to the public in the Museum’s first floor visitor center. Artist Peter Waddell, who is renowned for his exceedingly detailed historical paintings, has shown in more than 20 exhibitions over his career. His colorful and lively work evokes a sense of incredible realism—as if we could step through the canvas and into a different time. We are honored to have him work with us on this artistic interpretation of Clara Barton’s life. $50 - receive a postcard of the mural signed by the artist. $250 - receive a signed poster print of the mural. $500 - invitation to preview the mural with the artist.